All of us Cincinnati Reds fans could use some relief. It'd be great if it came in the form of relief pitchers. 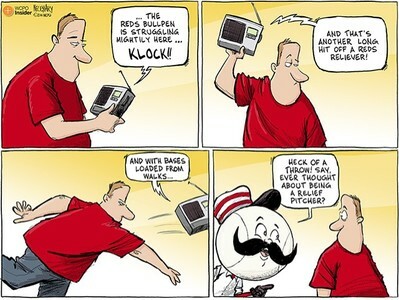 WCPO.com's Editorial Cartoonist Kevin Necessary muses on the latest Reds games in this week's cartoon. You can connect with cartoonist Kevin Necessary on Twitter and view his work here . Here's a look at Necessary's website. Share this cartoon on Facebook and Twitter.